Today I will talk about yet another costume whose region is bisected by an international border. This is found in a region north of Milan, in the northwest of theregion of Lombardy, Italy called Brianza and the neighboring region of Mendrisiotto in Switzerland. Here is a map of Northern Italy and its neighbors. Lombardy is shown in orange in the middle. The region of Brianza is more or less centered around the city of Como. 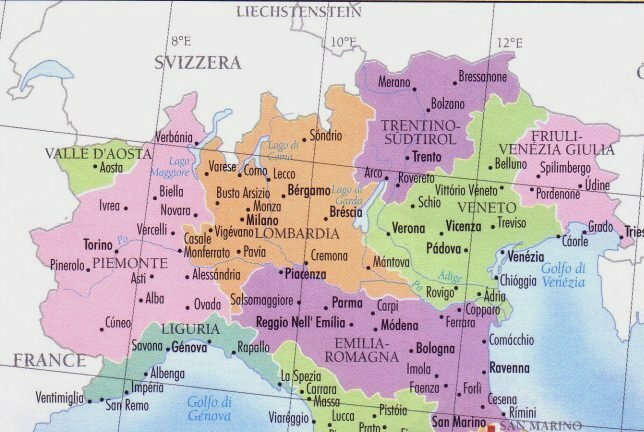 Here is a map of Lombardia with Brianza labelled on it. Brianza is a historical region and has no current official boundaries, overlapping several contemporary provinces. Mendrisiotto is the southernmost part of the arm of Switzerland just northwest of Como, south of Lake Lugano. 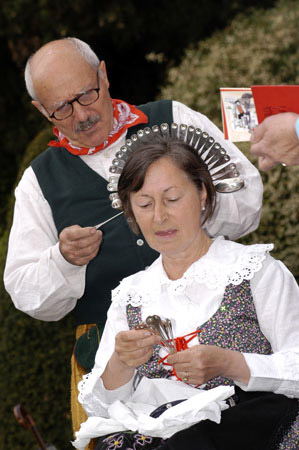 The traditional language in most of Lombardy and the Swiss Canton of Ticino is Lumbard. This has historically been considered to be a dialect of Italian, but recently linguists describe it as a language of the Gallo-Italic group, along with Ligurian and Piemonteis. The definition of Lumbard as a dialect was based mostly on political grounds, and the fact that it is somewhat similar to Italian, more so than Ladin or Friuli, for example. Lumbard is quickly being replaced by Italian on both sides of the border, a fate which is shared by many of the minority languages and dialects of Europe and the rest of the world. For those who are interested, here is an article about Lumbard written in Lumbard. For English or other language translation, click on the list at the left. We tend to think of languages as being 'divided' into various dialects. In fact, the opposite is true, Dialects are grouped into Languages. 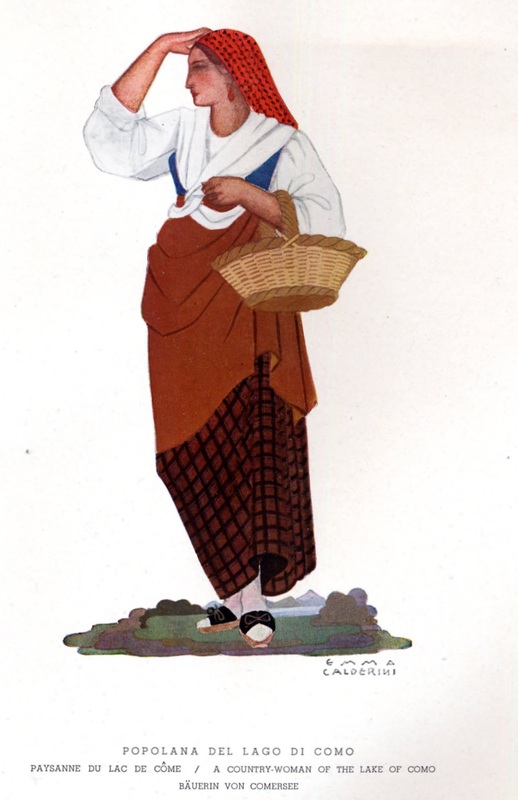 Each local dialect exists independently, having Its own history and its own life in its community. Groups of similar dialects are placed under the heading of one language or another, often for political reasons, and some very divergent ways of speaking are often shoehorned into a language for other than linguistic reasons. 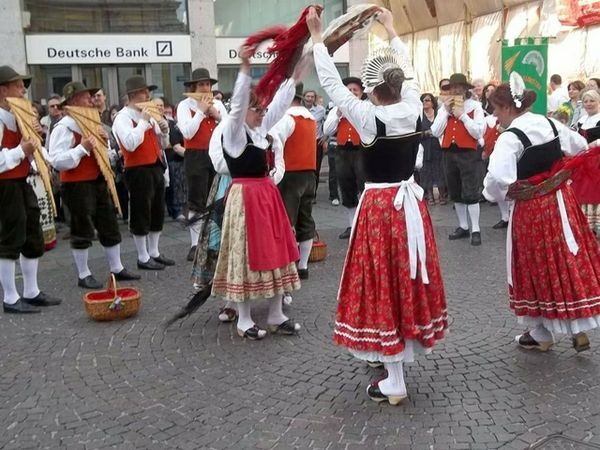 This costume is found on both sides of the border, in fact, the only reason why Mendrisiotto is not considered to be part of Brianza is that it is in Switzerland. 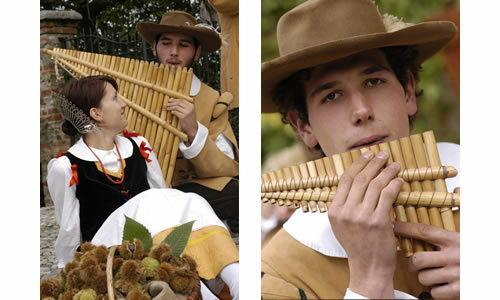 Switzerland is unique in the world in being a nation that is identified not with one ethnicity, but several. This is actually true of most nations, but most do not readily admit it. Often residents of Yugoslavia, Czechoslovakia, the Soviet Union, etc, were told to take the Swiss as an example. This was not helpful, as there was one huge difference; the Swiss Confederacy was VOLUNTARY. Let us take a look at this costume. Here is the depiction of the Italian version of this costume by Emma Calderini, an eminent expert on Italian costume. Here is a photograph of the Swiss version. The costume on the right is the everyday attire. The only significant difference which I see is the collar of the chemise. Here is my translation of Emma Calderini's description of this costume. 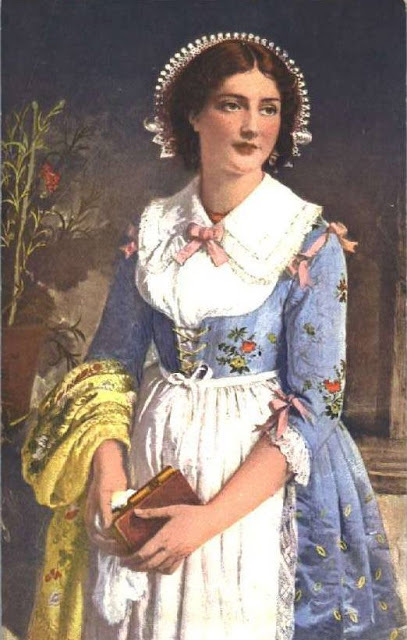 'This costume is worn for grand occasions, composed of a chemise of fine linen, ornamented with lace and silk ribbons.. - The bodice is laced up in front, and the skirt is very full, of heavy silk embroidered by hand. 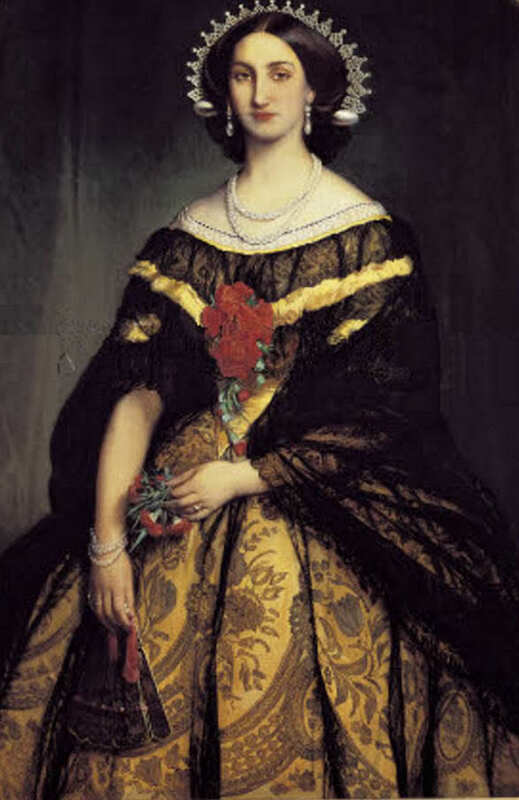 - The sleeves are attached to the shoulder of the bodice by ribbons. 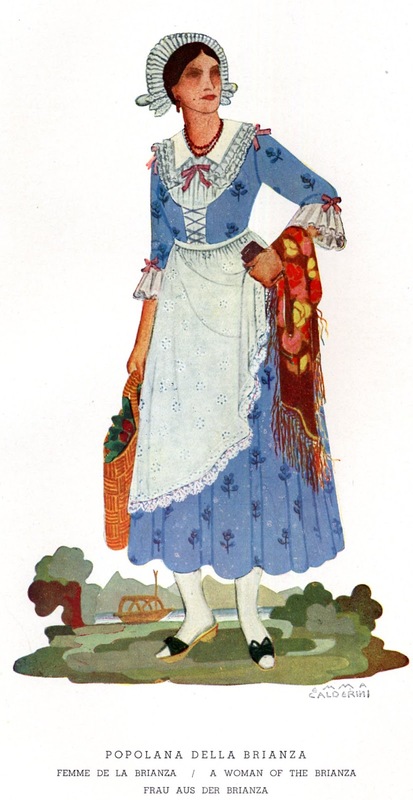 - The apron is of fine linen with embroidery, openwork and lace. - The shoulder shawl is in wool of vivid colors. - Knit stockings. - Wooden clogs with leather straps. - Coral necklace, silver spadini in the hair, hanging earrings of gold and coral'. 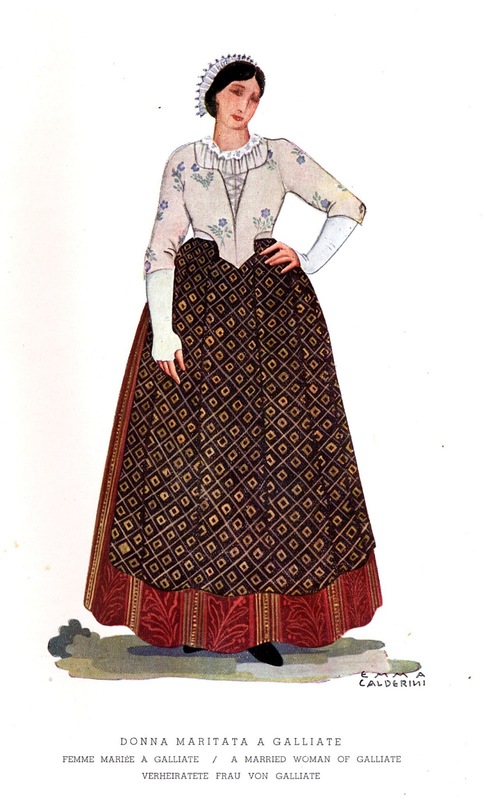 For comparison, here is Emma's print of the everyday costume of this region. 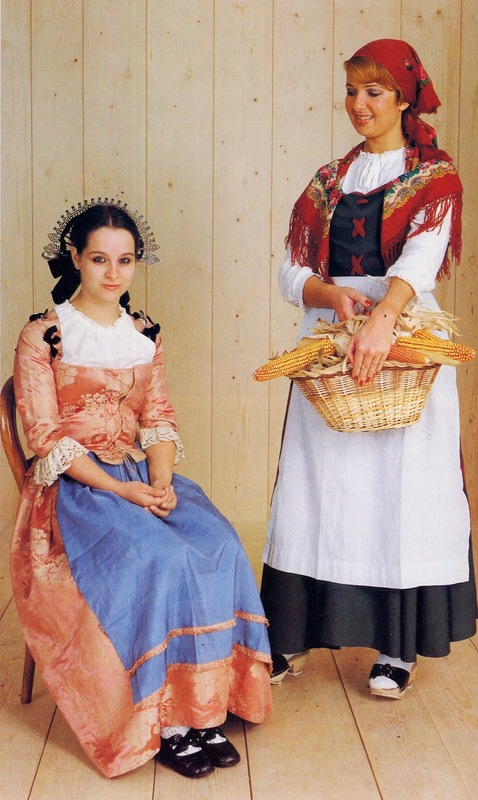 You can see that it agrees substantially with the Swiss photograph above, chemise La camicia (camisetta), petticoat La sottogonna (suchin), bloomers I mutandoni (moudant), skirt with bodice La gonna con corpetto (soca cul curpet), shoulder shawl Lo scialle (scialet), apron Il grembiule (scusà), clogs Gli zoccoli (socur a la muntagnina), headscarf. [The first of each translation is in Italian, with the Lumbard term in parentheses]. The only differences are the colors used. 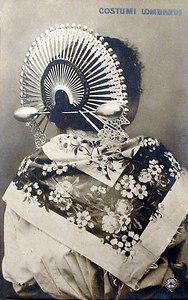 I am sure that a variety of materials was used for the everyday costume. Red and black checked or striped material was popular in Lombardy among the peasants, here is an example of an apron in the Linen Museum of Lombardy. The major difference between the everyday costume and the festive is the quality of materials used. I do not have any closeups of the embroidery on the bodice, skirt or apron, but they seem to be standard floral motifs. 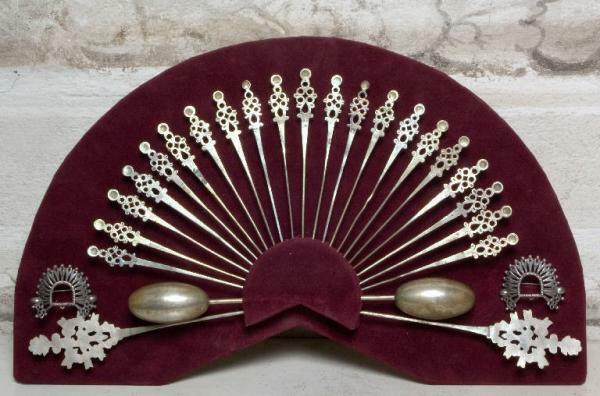 I am sure that brocade was also used, according to taste and pocketbook. Emma simply says that the festive apron is 'perforated', by which I suppose that she means cutwork. 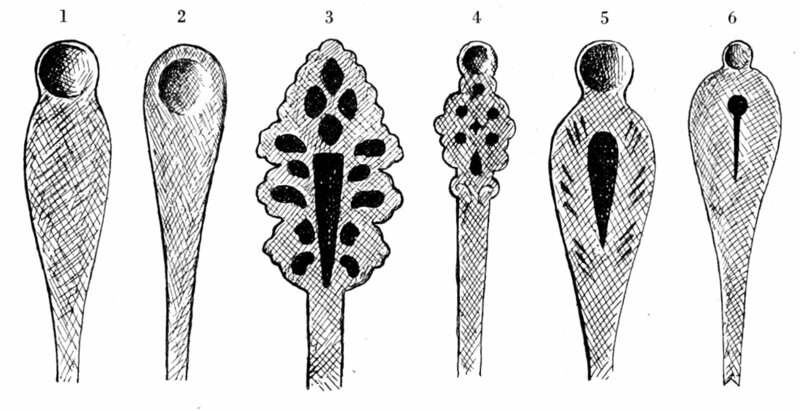 You can see in the print that the cutwork is distributed across the field of the apron. 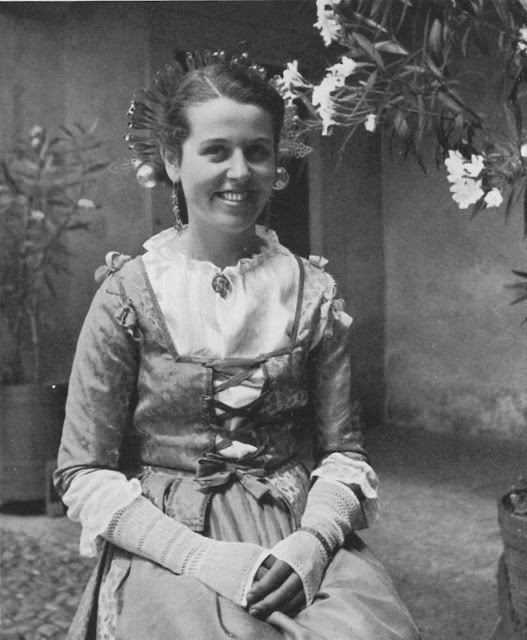 The separate sleeves are very common in Italian Folk Costumes, In other regions a gap is often left where the sleeves of the chemise puff out, but here they are tied right up to the bodice. 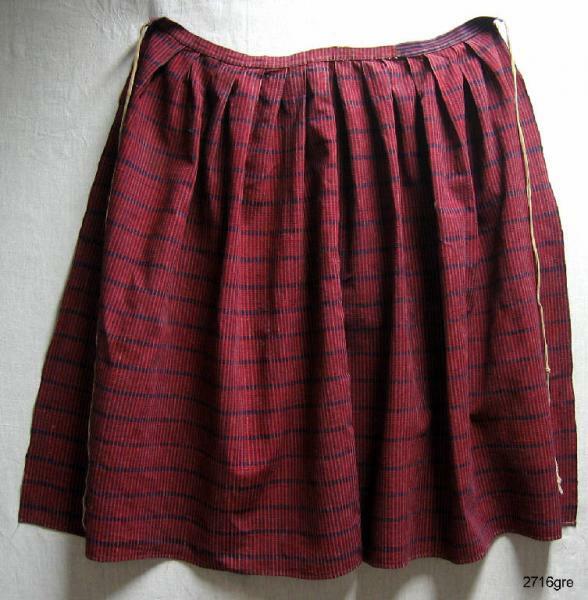 Historians say that this was originally a way to circumvent either taxes on clothing or sumptuary laws, which were common in western Europe. 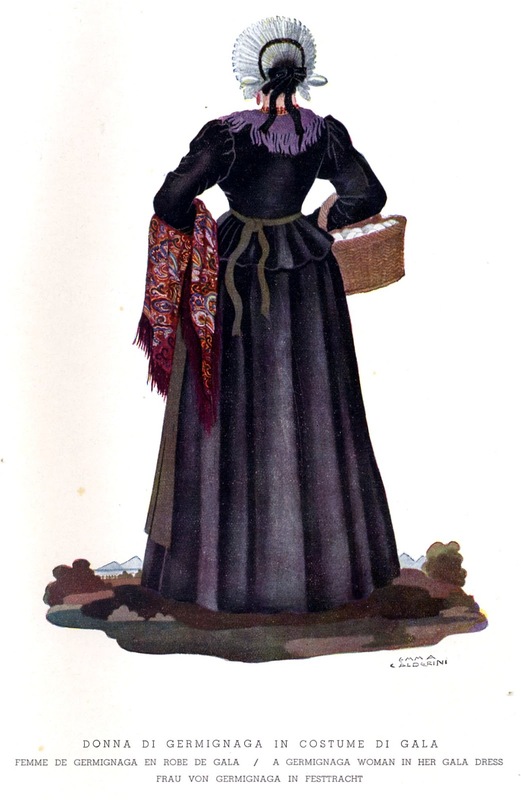 The purpose of sumptuary laws was to prevent people from wearing clothing which was, in the eyes of the local authorities 'above their station', or a perceived waste of resources. Such laws were commonly ignored, flouted, or circumvented by those who could afford to do so. This costume is a survival of the formal costume of the area going back several centuries. 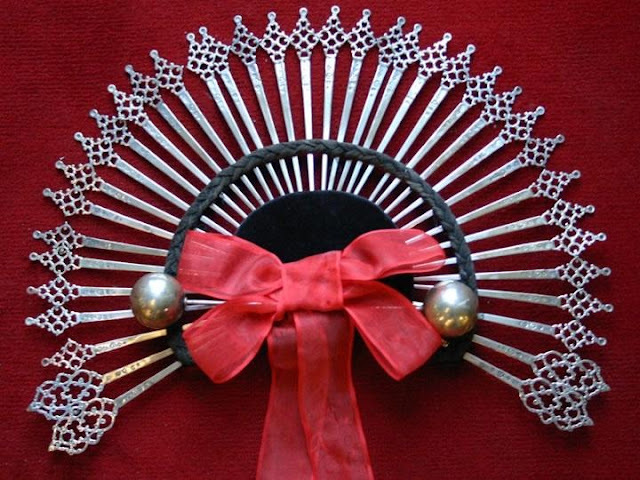 The most distinctive part of this outfit is the formal headdress, called La Raggiera (Sperada), or Guazza (Cuazz). It has a long history in this area, dating back to the 16th cent. 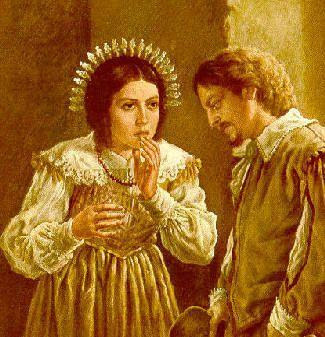 [it is obligatory when writing about la raggiera to note that it is explicitly mentioned in "I Promessi Sposi', the third most famous piece of Italian Literature, after Dante's 'Divine Comedy' and 'The Adventures of Pinocchio'. 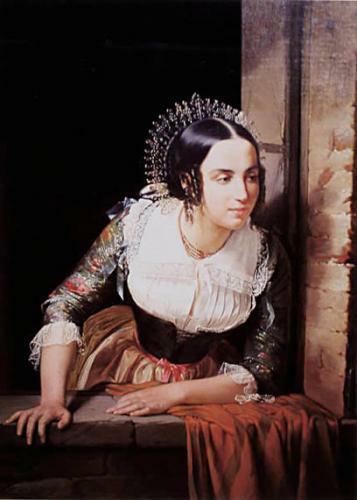 I Promessi Sposi was set in this region]. 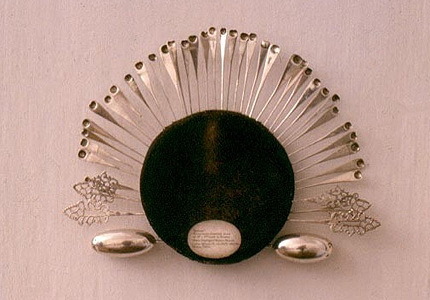 Originally this was composed of a set of large silver hairpins, a couple dozen or more, of three different types. [The first set includes a pair of matching earrings]. 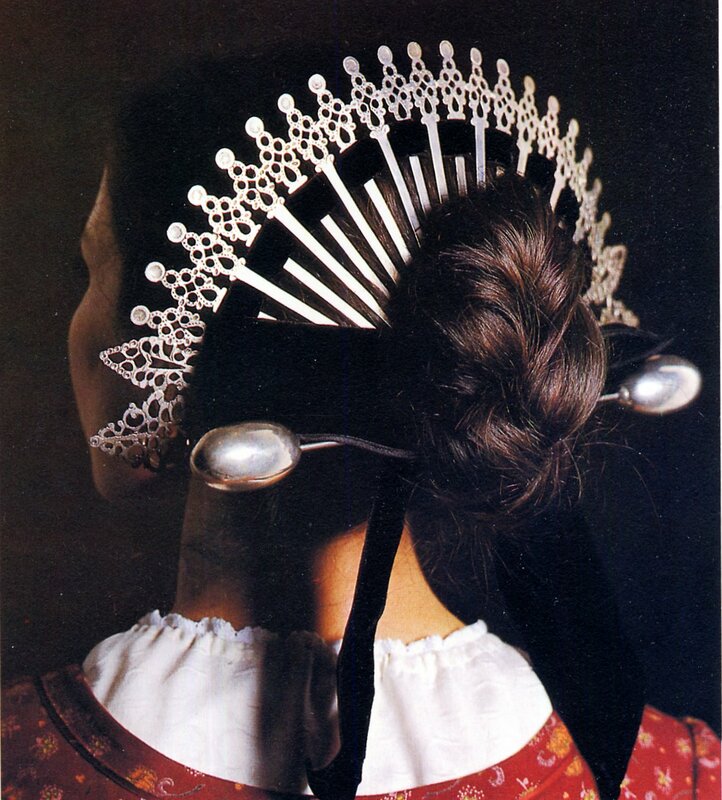 The hair was gathered into a chignon at the nape of the neck, and braids were attached in a circle on the back of the head. The 'spilloni' were arranged through the braid and into the chignon. There is one large sticklike pin with olive or ball shaped ends, the Sponton, which secures the bun, 1 to 3 pair of larger pins which anchor each end, the Spadine, and the remainder are spoon shaped and usually smaller, the cucchiaini, the concave shape on the ends catch and scatter light. 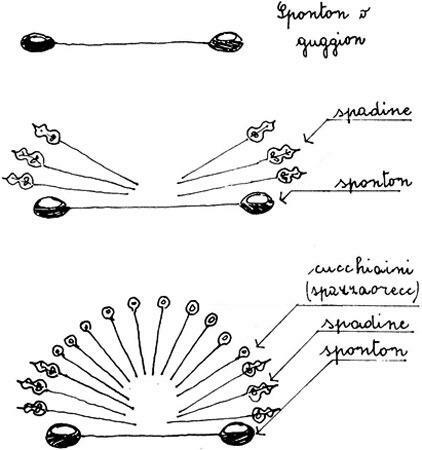 Here are some drawings of the various types of hairpins used. 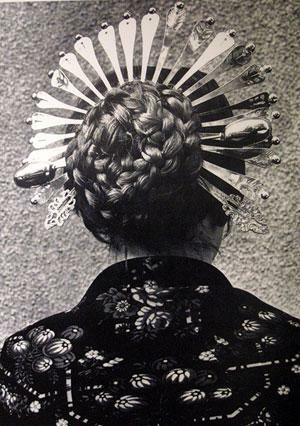 This was obviously difficult to assemble, so later on a fake braid was incorporated into the headpiece to hold the spilloni together at consistent intervals, and the ends were then pushed into the bun. This structure may be embellished with a silk or velvet ribbon. Some examples look suspiciously like they were made as one piece of metal. 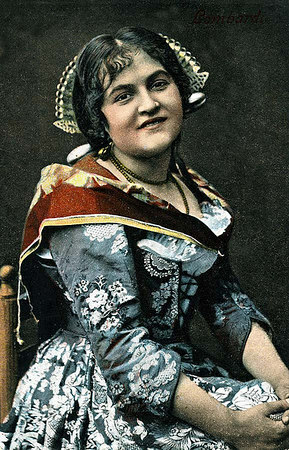 This is so striking and attractive that la Raggiera also forms a part of several other similar costumes in the general region. A smaller version of la raggiera also figures in the less bourgious costumes of Parre in Lombardy and Belluno in Veneto, each of which I plan to do a future posting on. A few photos of performing groups in Brianza wearing variations of this costume. 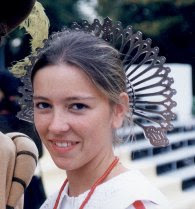 What do you think is the reason for the large number of elaborate head-dresses and hats for women in folk costumes? They often seem more elaborate than the rest of the costume put together - and generally a lot more time-consuming to put on, impractical and generally ridiculous looking (although this one is rather nice). All of this is true, although generally I do not agree that they are ridiculous looking, I find the majority to be quite attractive. Firstly, since when have practicality and fashion been found together? How practical is it to pay an exorbitant amount of money for pre-distressed jeans which are identical to everyone elses? Many of the things which women wear today are impractical, and a good number are ridiculous looking, if not downright ugly. If we only considered practicality, everone would wear plain jeans and a t shirt. 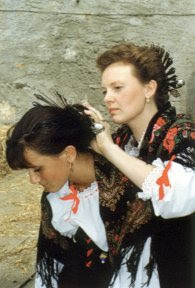 The folk costumes which are retained are the costumes for Sundays and special occasions, the everyday work costumes are always simpler and more practical. On special occasions woman always want to dress up. The work and skill needed to make the costumes was valued for its own sake. 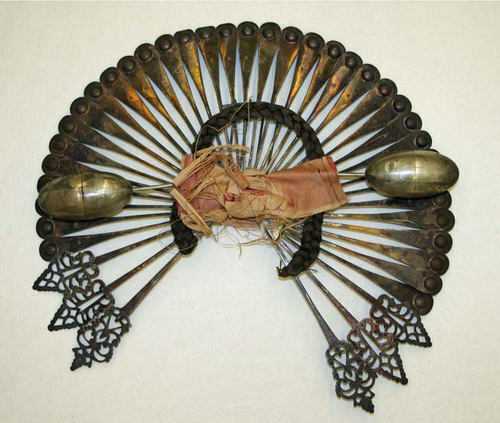 Since untill recently it was imcumbent upon women to cover their hair, the headdress was a natural focus for innovation and talent. 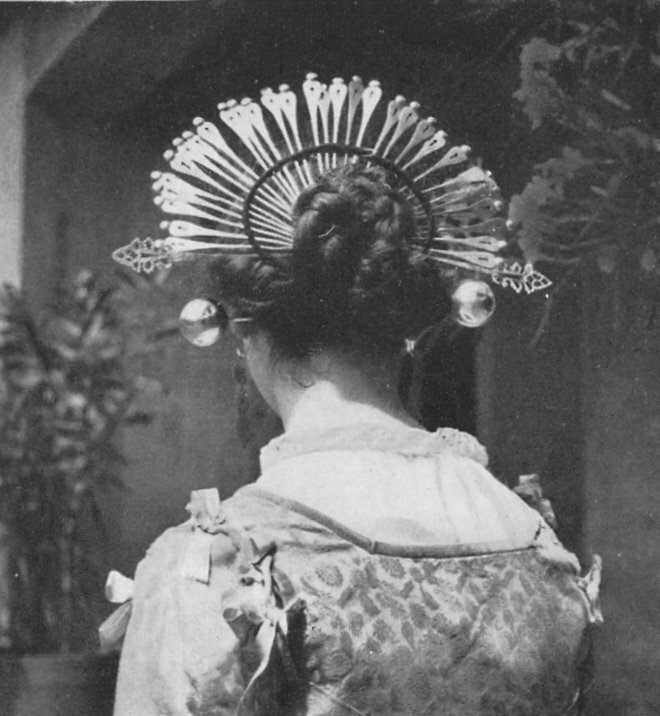 It is among the most visible part of the costume. You wore a headpiece with elaborate embroidery or lace to show off your skill. Secondly the costume, and most particularly the headpiece forms a badge of identity. It shows the world which village you are a part of, which region, and in mixed regions what your ethnicity is. 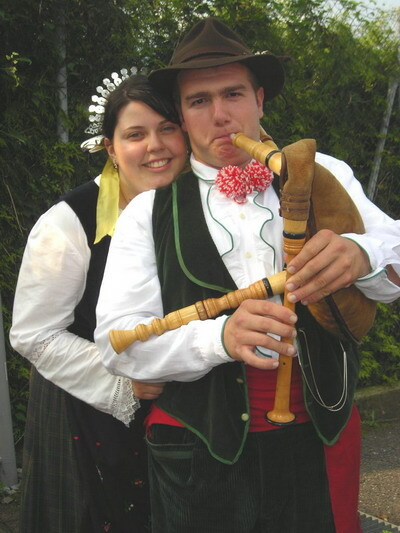 In Tirol, for example, the costumes are similar, but each valley has its own style of hat. Thirdly, there is the strength of local tradition, often combined with superstition. There are many superstitions about the power of womens' hair. 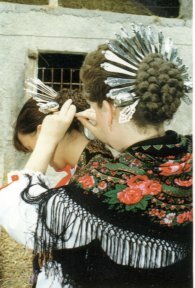 The local costume is a powerful symbol of belonging to the community. You are writing with the assumption that something simple, easy to move in and quick to put on is better. 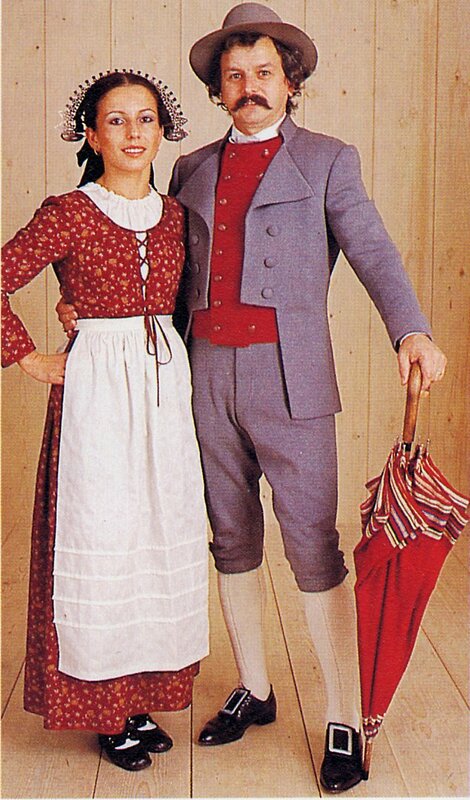 People who wear folk costumes, especially in their traditional context would not agree with any of those assertions. The very elaborateness is seen as being impressive. 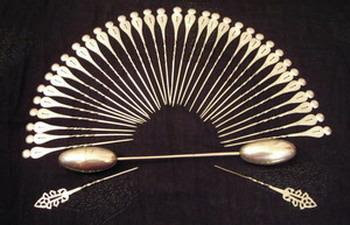 Fine handmade lace or embroidery is likewise seen as self-expression and skill in handwork and creativity. Wonderful answer! I agree that they are quite beautiful costumes and the headpieces are stunning! It's interesting the folk costumes. I would like to try this.